It is observed that often small businesses tend to learn payroll management by ‘trial and penalty’ method. When an entrepreneur takes the first step, they have little or no idea about how payroll calculation and payroll processing works. This further complicates the situation, resulting into several instances where they miss the first few payments that are due to federal government and initial unemployment, workers’ compensation and local tax with holdings as well. This is where they are penalized, and they realize that things are not as per compliance with the federal regulations. The inability to meet the payroll tax requirements, has often stalled the business growth. In worst case scenario, it has even resulted into shutting down the businesses from making it go bankrupt. It is believed that penalties occur typically due to a lack of awareness. Since, it is not a core area of expertise, several business owners find it challenging to keep up with the payments. Moreover, payroll management has a lot of legal implications, which frequently change. Sometimes, it is observed that the payment schedules change from once a quarter to once per pay period. This often happens without any prior notice. Apparently, payroll management does not fall in their core areas and so small business owners hardly understand the intricacies of payroll. But these so called small businesses are often big enough to have a proper payroll system in place, and are never too large to hire a full-time professional who can handle payrolls. And it is here that outsourcing payroll management provides the much-required help. How Outsourcing helps to Stay Compliant & Avoid Payroll Penalties? An outsource payroll service company helps in managing the entire payroll process. They aim at drafting client’s account and ensure money is regularly sent to the tax regulatory bodies on your behalf. Since, payroll service providers are basically into the business of compliance, therefore, they enable the business owners to concentrate on the general business development. Why businesses are hesitant to partner with an outsource payroll service provider? 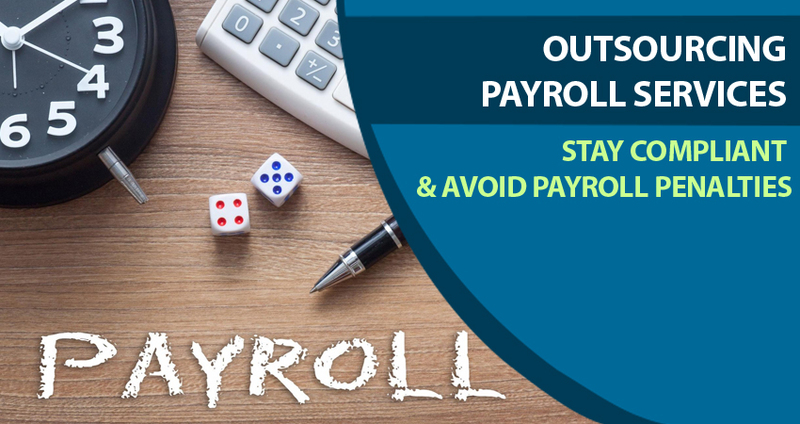 Business owners who do not opt for an outsource payroll service provider, often do it because they think it will be expensive. This, however, is a completely false assumption. Typically, the cost for the service is based on a certain percent of money going out through payroll. Rather, it is just a flat fee which is usually equal or less than their regular phone bills. Moreover, sometimes a business owner thinks the company is just too small to get a payroll service. However, they don’t realize that thousands of small-scale enterprises with less than 10 employees usually partner with payroll service providers. Another assumption is that business owners generally lose control over the company’s payroll functions, once they outsource it. Whereas the truth is that business owners can maintain complete control over their payroll while working with the outsourcing partner. They can write payroll checks as per their requirements; they only need to keep their providers in the loop, so that the check gets accounted for. Wrapping up, payroll is considered as one the easiest tasks a business can outsource. There are hardly any upfront fees or length of service contracts. It relieves the business owners of the load that they encounter while handling the payroll process. This further eliminates the chances of any potential business-destroying penalties.